Alison Zatta: That's a wrap! Well, we did it! That is, we officially completed production on Girl Meets Roach. 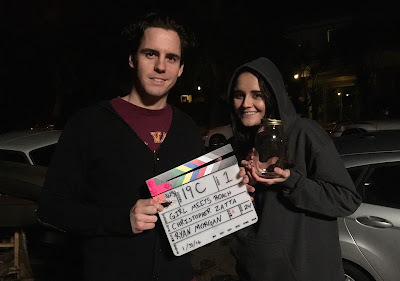 We wrapped on Sunday night after a second long, but super-fun, weekend of shooting. I can't wait to see how it all comes together! Next stop for the footage is our editor, my supremely talented friend Kylie. There's still plenty to do, but for now, we celebrate! The final slate! Me and Christopher (director/brother extraordinaire). © Alison Zatta 2015. Simple theme. Powered by Blogger.